What is a Fusible Link Valve? How does it operate? Any of a variety of valves, usually for oil but sometimes for gas which contains a fusible link and a spring. The fusible link is a low melting point alloy, chosen to melt at a certain temperature, depending on the application. The link is arranged -- in the variety I suspect you are enquiring about -- so that it holds a valve in the oil line open against the force of a spring. 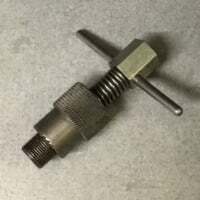 If the temperature gets too high, the link melts and the spring shuts the valve. Which one specifically are you talking about? There is suppose to be one (typically called a firomatic) at the burner and one at the oil tank, for the oil lines, and there should be one above the heating appliance in series electrically with the main shut-off to the system (burner).